Now that all of the wheelie bins have received a sticker notifying residents of what materials can go into the recycling bins, its now the turn of all the bins on estates, small blocks and new developments. As most people are now aware, you can now recycle tins, glass bottles and jars, paper, cardboard, plastic bottles, mixed plastics, beverage cartons (tetra-paks) and also textiles. New stickers are now appearing on all large bins across the entire borough. Whilst we are very clear about what we want people to put into the recycling bins, we are also very clear about what we don’t want people to put into the recycling bins as well. Last week Council staff spent 3 days at the materials recovery facility (MRF) at the Bywaters plant in east London, where all the recyclable materials go to check on contamination levels. Whilst generally speaking things were looking OK, there were some loads that we would sooner not have seen. One particular load contained all manner of food waste which by the time it came to the sorting process was looking and smelling very rancid indeed. Included in this particular load was several nappies and other vegetable matter. Loads with this level of contamination cause lots of problems at the sorting facility as the wet food waste leaks and contaminates other parts of the load rendering them unrecyclable. When loads come in like this, the recycling facility can and do reject them which means it will end up being incinerated with all revenue being lost. We are asking all residents now to be more vigilant than ever when it comes to making sure the right materials end up in the recycling bin. Our crews are also doing their part by checking bins and where they see bins that they suspect are contaminated, they will tag them to ensure they don’t end up in the back of the recycling truck and spoil the good work of the rest of the residents. As has been stated in previous blog stories and tweets that have been put out, the simplest way to ensure that you are putting the right thing in the recycling bin is to check the bin sticker on the lid. If the item that you want to recycle does not appear on that sticker, then please use your refuse bin instead. We also ask people to give tins and jars a quick rinse to ensure all materials are clean. To give an example of this, we witnessed a half full jar of jam in one load which was removed to stop it (pardon the pun) spreading to the rest of the load and causing further issues. If dirty items are put into the recycling bins, this will decrease their value. 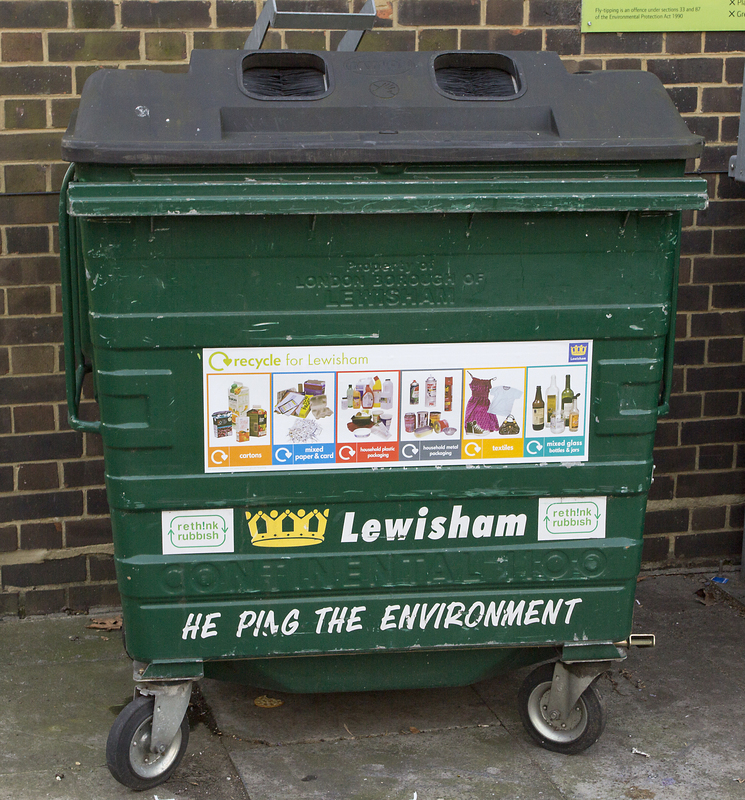 Categories: community engagement, Environmental Campaigns, recycling | Tags: contamination issues, how to recycle correctly in Lewisham, New stickers on estates bins, Recycle correctly, stickers on bins | Permalink.